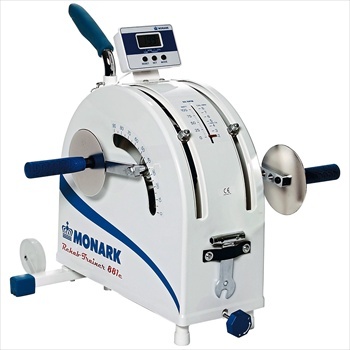 The Monark 881E is an arm and leg ergometer that allows the user to perform exercise without the clinician's supervision. A control knob adjusts resistance and a graduated scale provides a readout in watts at a speed at 50 revolutions per minute. The clinician can document the user's effort by noting the power or working generated during the therapy session. Electronic meter shows pedal rpm, total pedal revolutions and time. Each pedal crank can be individually adjusted both horizontally and vertically to a measurable level, ensuring reproducible positioning.